When the peoples of the Indian Territory found themselves in the midst of the American Civil War, squeezed between Union Kansas and Confederate Texas and Arkansas, they had no way to escape a conflict not of their choosing–and no alternative but to suffer its consequences. When the Wolf Came explores how the war in the Indian Territory involved almost every resident, killed many civilians as well as soldiers, left the country stripped and devastated, and cost Indian nations millions of acres of land. 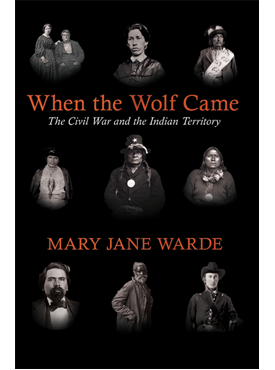 Using a solid foundation of both published and unpublished sources, including the records of Cherokee, Choctaw, and Creek nations, Mary Jane Warde details how the coming of the war set off a wave of migration into neighboring Kansas, the Red River Valley, and Texas. She describes how Indian Territory troops in Unionist regiments or as Confederate allies battled enemies–some from their own nations–in the territory and in neighboring Kansas, Missouri, and Arkansas. And she shows how post-war land cessions forced by the federal government on Indian nations formerly allied with the Confederacy allowed the removal of still more tribes to the Indian Territory, leaving millions of acres open for homesteads, railroads, and development in at least ten states. Enhanced by maps and photographs from the Oklahoma Historical Society’s photographic archives, When the Wolf Came will be welcomed by both general readers and scholars interested in the signal public events that marked that tumultuous era and the consequences for the territory’s tens of thousands of native peoples. Mary Jane Warde is the author of Washita and George Washington Grayson and the Creek Nation. Winner of the 2014 Pate Award from the Fort Worth Civil War Round Table.